Madhuri is a poor but well educated girl, born and brought up in a small village. She and her younger brother, Srikant, live with their widowed mother. The family is overjoyed when Madhuri’s marriage is fixed with the son of very rich man in the city. Madhury, the rich seth, had himself married a village girl, and had a very happy married life. He, therefore, wanted his son Amit to also marry the village girl. Madhuri Amit, however, born and bred in the city, did not want to marry a village girl, but was too weak to defy his father. At the wedding, however he got a chance. Finding an excuse that even this dominating father could not refute, he refused to accept Madhuri as his wedded wife even though they had completed the “Saat Pheras”. And thus Madhuri became a “Bahurani” but got neither as husband nora‘ Sasural. But Mahhuri was determined to change her fate. Bahurani is the story of how Madhuri changed her personality and earned the love and devotion of her husband. 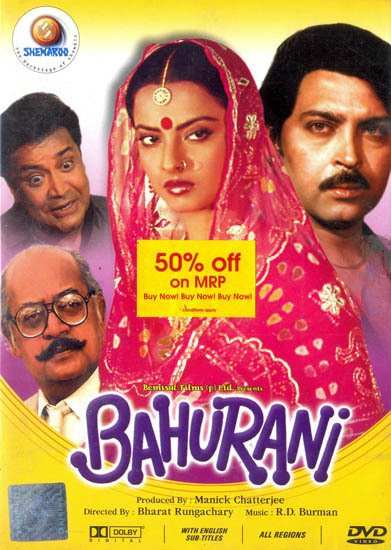 Bahurani is the story of Indian Womanhood and the greatness of the Indian “Bahu”. It is a film for all the family young and old.